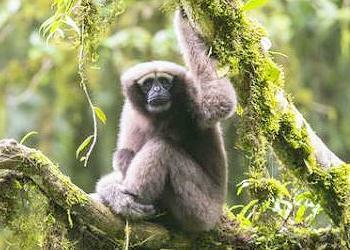 GUANGZHOU, China, January 14, 2017 (ENS) – An entirely new species of gibbon has been found living in the forests of the Gaoligong mountains of southwest China, but the discovering scientists are calling for it to be immediately listed as Endangered on the Red List of Threatened Species kept by the International Union for the Conservation of Nature, IUCN. The discovery, detailed in a paper published in the “American Journal of Primatology,” describes a new addition to the genus of hoolock gibbons by a research team led by Professor Fan Pengfei from Sun Yat-sen University in Guangzhou. Experts from the Zoological Society of London were on the discovering team. The genus is already known to include two previously-described living species, the western, Hoolock hoolock, and eastern hoolock, H. leuconedys, gibbons, geographically separated by the Chindwin River. Based on a comprehensive study of the genetic characteristics of wild gibbons and museum specimens, and assessment of coat color patterns and tooth morphology, the team believes that the population of hoolocks living to the east of the Irawaddy-Nmai Hka Rivers, previously assigned to the species H. leuconedys, are actually morphologically and genetically distinct from those west of the river. The scientists are asking that these animals be recognized as a new species – the Gaoligong or ‘Skywalker’ hoolock gibbon, H. tianxing sp. nov. The Star Wars-inspired name reflects both the high treetop home of the gibbons and the historical Chinese view of them as almost mystical beings. The Zoological Society of London warns that more than 58 percent of the world’s wildlife has disappeared since 1970.